Crossman Automation provides engineering and manufacturing of Danfoss Variable Frequency Drives for Industrial and Oil field applications. We are a Systems Integrator, offering our standard designs and custom egineered designs, specific to your application and environment. Artificial Lift (ESP, PCP, BEAM, ROTOFLEX) are achieved with patented Sensorless Artificial Lift Technology (S.A.L.T. ), a Well Manager Interface. Vacon, a member of the Danfoss organization provides a strong lineup around the globe with a presence of sales offices in 29 countries and AC drives being sold by partners in approximately 90 countries. 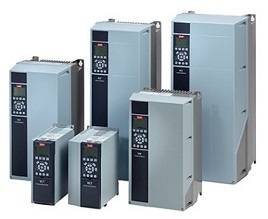 Vacon AC drives offer optimum process control and energy efficiency for electric motors. Vacon inverters play a key role when energy is produced from renewable sources. Crossman Automation is a full line supplier of Vacon VFD'S for the commercial and industrial industries. Danfoss Drives is an industry leader in the market with facilities worldwide to service and support its products. Danfoss is independent of motor manufacturers and have the ability to adapt to any motor technology. This freedom will enable you to choose the motor technology and motor manufacturer that best suit your application to ensure its peak performance and optimized energy consumption. By making the right choice of drive and optimizing your entire system it will offer a potential energy savings of up to 60%. As a full line supplier, Crossman Automation can supply VFD's for the commercial and Industrial market place. We can also supply soft starters and several input harmonic and outpit filter options. Crossman Automation is able to provide technical support and repair services on Danfoss and Vacon Drives. We have the ability to configure a custom application to suit your needs on either the Industrial and commercial site you are operating. For further support in choosing the right drive for your application, please give us a call. By choosing Danfoss, you can rest easy knowing you will recieve a quality product and services when you need them. Crossman Automation has been an authorized low and medium voltage VFD distributor for Cutler-Hammer for over 10 years. We have the capability of providing many different drive configurations from chasis mount through MCC style arrangments. The majority of packages we supply have standalone outdoor type for artificial lift applications related to oil production. We have worked closely with C-H application engineers and designers to produce panels for all environments.